Wood-burning fireplaces. Typically regarded as traditional, wood-burning fireplaces allow homeowners to make the best use of natural resources. For this reason, they are often cheaper to operate. Gas fireplaces. Gas fireplaces provide the ambiance of their traditional wood-burning counterparts but tend to be cleaner and more efficient. They supply constant heat with none of the fumes or sparks associated with burning wood. Pellet stoves. Pellet stoves burn wood composites that are compressed into pellets. Pellet stoves provide the visual benefits that are similar to a wood-burning fireplace with higher energy efficiency. The fuel costs for pellet stoves are also lower than gas. How much will it cost to have a fireplace installed? Many things can affect the cost of installing a fireplace above and beyond the expense of the model being purchased. Things such as the condition of the current chimney, type of fuel and structure of the home can all affect the cost of fireplace installation. How long does it take to install a fireplace? As in pricing, many factors are unique to each home that affect the time required to install a fireplace correctly. Installing a fireplace can be completed as quickly as one day or as long a one week. Our technicians do their best to complete jobs as soon as possible, without sacrificing the safety or quality of the workmanship. The right choice depends on your personal preference. We recommend discussing your needs with a professional. A professional technician can then make a recommendation with your preferences in mind. What are fireplace inserts and why might I need one? Fireplace inserts are stoves that are installed in existing fireplace openings converting inefficient open fireplaces into energy efficient stoves. Inserts can be designed to use wood, gas or wood pellets for fuel. Fireplace inserts can also be used to convert a wood burning fireplace into a gas fireplace. Can I operate my fireplace during a power outage? 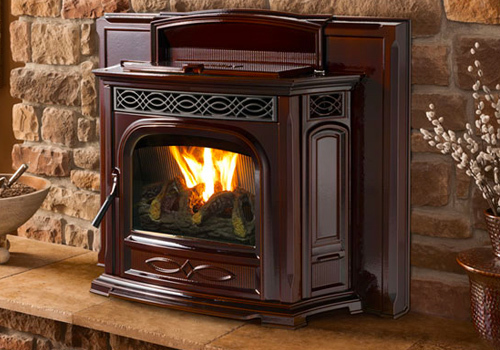 Most gas and wood-burning fireplaces work seamlessly during power outages. However, select fireplaces possess electrical components, which make the successful operation less likely in the event of a power outage. Additionally, many pellet inserts require electricity to operate. All Pro Chimney Service can help you determine how your fireplace might respond to a power outage. They can also help you select a unit that will work regardless of whether your home has power. Fireplaces burn fuel inside your home. When done right, a fireplace is an amazing device that provides warmth and appeals to your home. When done wrong a fireplace can be a severe safety hazard. Fireplaces should only be installed by licensed, certified, professionals. In addition to safety, the professional installation also ensures that the manufacturer warranty remains in effect and that your installation is compliant with the building codes. How can I get rid of fireplace odors? Wood-burning fireplaces sometimes give off distinctive odors. These depend somewhat on the type of fuel used. Odors may also accompany gas fireplaces. Among old fireplaces, unusual smells may indicate a need for thorough cleaning. Adhesives for surround materials could also lead to fireplace odors. If you find odd smells coming from your fireplace, the team at All Pro Chimney can help.